It’s hard to believe that this time last year, we were experiencing some of the coldest temperatures on record, with snow and ice covering the ground like a picture from a traditional Christmas card. It has been very mild in comparison so far this winter, which makes it seem strange that Christmas is just around the corner. But for me, nothing evokes that festive feeling more than the wonderful scent of the Christmas spices. Warming spices such as ginger, cinnamon and cloves are traditionally associated with Christmas time, They have long been used to flavour mince pies, Christmas cakes, plum puddings and mulled wine. It is often the case that there is a wisdom behind such traditions, and the use of aromatic spices at Christmas time is no exception. They are very beneficial at a time of year that is typically associated with cold weather, winter bugs and overindulgence. Spices such as ginger, cinnamon and cloves have a warming effect on the body. They stimulate the circulation, warming up cold hands and feet and easing joint pain and stiffness. When taken regularly, ginger root (Zingiber officinalis) is particularly effective for improving poor circulation and for treating Raynaud’s disease, which is associated with numbness of the fingers and toes in cold weather. It can be added to food or used to make a tea. 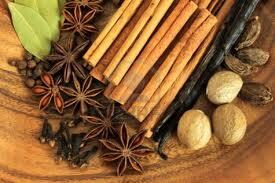 Warming spices such as ginger, cinnamon, and cloves also stimulate the digestive system. They are very useful for combating the effects of overeating and indulging in too many sweet or rich foods. They help to relieve indigestion, nausea, hiccoughs, trapped wind and bloating, which affect so many people during the festive season. The cold weather is also associated with various winter bugs. The aromatic spices kill the bacteria and viruses that cause these infections and help to ease the symptoms of illness. The inner bark of the cinnamon tree (Cinnamonum zeylonicum) is active against the bacteria and viruses that cause coughs, colds and stomach bugs. A cup of cinnamon tea is a relaxing expectorant, which helps to remove excess phlegm from the lungs and eases coughing. In the digestive system it prevents nausea, vomiting, cramping pains and diarrhoea. Cinnamon also prevents the growth of Helicobactor pylori (the bacteria which causes stomach ulcers) and Candida albicans (a yeast which causes digestive disturbance, thrush and a whole range of other health problems). The flower buds of the clove tree (Syzygium aromaticum) have similar effects to cinnamon in the respiratory and digestive systems. Whole cloves can be used on their own or with cinnamon to make a tea, but they are more frequently added to hot whiskey, mulled wine or elderberry juice to make a warming winter drink. Clove oil, which can be purchased from pharmacies and health food stores, is particularly effective against the herpes virus, which causes cold sores. At the first signs of tingling add a few drops of clove oil to a suitable carrier oil (such as olive or almond oil) and dab onto the affected area using a cotton bud. Clove oil also acts as a local anaesthetic which is particularly effective for toothache. Put a few drops onto a small piece of cotton wool and place in the mouth next to the offending tooth. This helps to fight any infection and numb the pain. A few drops of clove oil can also be added to alcohol or to a suitable carrier oil and used as a liniment for arthritis which is often worse in cold weather.